The Queensland University of Technology (QUT) in Brisbane, Australia, was in the process of building a $230 million state-of-the-art science and engineering center at the Gardens Point campus. As an education provider, QUT wanted a digital installation that would form the heart of the new center, deliver knowledge and provide an engaging visitor experience. The university leadership envisioned a building that could reach out and showcase science and technology to Brisbane and beyond. Pro AV, the Australian member for the Global Presence Alliance and the company charged with creating the installation, was faced with the challenge of creating a building exciting enough to draw people in. The answer lay with a high-impact audiovisual experience, which visitors could not merely see and hear but could actually have some control over. The Cube, as it was named, was to be a purpose-built interactive video wall space that engages people to touch content and discover facts about ocean life, learn about physics with wooden blocks, hear about the Brisbane floods and how social media had played its part, and much more. For the installation to make an impact, it needed to be big, And if it was to be operated by dozens of visitors at a time, it was going to take some amazing technology to make it work. Pro AV already knew about MultiTouch’s reputation. It is a company that boasts a huge portfolio of stunning interactive installations specifically designed to accommodate any number of people. A raft of big-name clients, including Siemens, Lincoln, Audi and NASA, have had installations built using MultiTouch products. MultiTouch creates LCD screens, known as MultiTaction Cells, that can be stacked together in any configuration to create giant interactive walls that work like single displays. MultiTaction Cells are truly multi-touch because they can process an unlimited number of simultaneous touches. So it’s feasible to build a stacked display that is big enough for 100 people to stand in front of, and each of those 100 people could work on the display at the same time using their fingers. MultiTouch has enhanced the appearance of stacked or tiled arrays with the development of the ultra-thin bezel display, which reduces the seam between adjoining MultiTaction Cells to a barely discernible 6 millimeters. Such attention to detail made MultiTouch the only sensible choice of partner for The Cube installation. Comprising 1,400 cubic metres, The Cube is one of the biggest spaces of its kind in the world and utilizes 48x 55-inch MT553 MultiTaction Cells—the world’s first and only interactive displays with an ultra-thin bezel LCD. The two-story-high Cube is dedicated to providing an inspiring, explorative and participatory experience of QUT's science and engineering research. Part science lab, part digital engagement, The Cube will be the hub of scientific exploration for high-school students, the QUT community and the wider public. The 48 MultiTaction Cell displays are used across five zones. The displays are complemented with edge-blended projection to provide a spectacular, fully immersive experience. Processing an unlimited number of concurrent touches, MultiTaction Cells boast a tracking speed of more than 200 frames per second while MultiTouch’s proprietary Hybrid Tracking technology renders the displays immune to ambient lighting conditions. The touchscreens allow visitors to interact with and control the single giant image that spreads seamlessly across the monitors and projectors. The images are real-time animations, created by a metric tonne of custom-built servers housed two floors above. Break-out areas are placed all around the building with a common view to content giving more visual impact from a distance. “The best way of thinking about it is as a giant, $3.5 million multiplayer video game that’s capable of absorbing busloads of school students at a time and switching them on to science and engineering,” said Gavin Winter, QUT’s Cube project manager. Currently on display in each of the five zones are the Virtual Reef, CubIT, ECOS, the Flood Wall and the Physics Playroom. 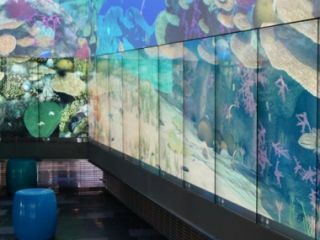 The virtual reef, which is so lifelike it gives the impression one could dive straight in, gives visitors the chance to interact with and find information on various fish species, corals and other marine life. It is even possible to rotate creatures in any direction to investigate them fully. In CubIT, the public can collaborate with and access research content shared by QUT's students and academics. The Community Science wall, in yet another part of this amazing installation, allows the public to connect with Queensland stories and experiences as told through a large-scale interactive map and timeline. For The Cube's launch, Community Science is showcasing the Flood Wall, a virtual and interactive storytelling of the 2011 Brisbane floods. Inviting play and reflection on the role of green buildings, the ECOS area presents data on The Cube using a simple and interactive game-like application. The data shows how energy consumption and generation impacts people in a variety of climates within a five-star rated green building like the Science and Engineering Centre, where The Cube is located. Finally, the Physics Playroom is a game-like environment where people of all ages can learn about physics. Objects in the virtual playroom can easily be found in any child's bedroom, from blocks to wooden horses and trains. Each of the objects is characterized by real-world properties, such as mass and friction. Additionally, the state-of-the-art room is governed by the laws of physics such as gravity and wind velocity. An audio matrix manages 96x80 audio paths for localized audio at LCDs and immersive audio for the projection zones. Video signal management is provided with five 32x32 matrix switchers and three videowall processors. Touch-panel control in the main server room and through an iPad docked in the wall structure allows management of signals from either within the installation or from the main rack. There are no less than four separate Cat-6 networks connecting the custom-built SGI servers to the displays. Video and multi-channel audio comes via Cat-6 transmitter/receiver pairs, and a separate network handles just the touch commands between panel and server. A third network allows the servers to communicate with each other to synchronize the animation elements as they pass between screens, and a fourth network, the QUT LAN, provides overall communication and control. Nine kilometers of structured cable were installed in total, and the entire installation was successfully completed within a compressed six-week program. The Center was opened on February 28, 2013, by the Australian Prime Minister and Queensland Premier, using The Cube as the venue centerpiece.